Through his unique position at the crossroads of architecture and social media, architect and Architizer.com founder Marc Kushner highlights 100 buildings, and the questions they seem to ask of us: How can we live smaller? Can a building breathe? 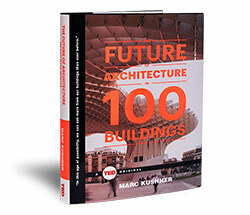 With stunning photography and stories of architectural wonder from across the globe, The Future of Architecture in 100 Buildings illustrates the rapidly evolving world of architecture in the digital age.